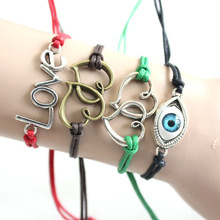 Turkish fashion simple double heart LOVE eye weave bracelet /Charm Bracelets Bangles For Women /H378 | Jewels, Didn't you Know?Jewels, Didn't you Know? Free Shipping - Order below 200 USD Free shipping by China Post Air Mail -Order over 200 USD free shipping by EMS. 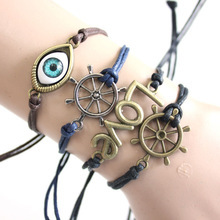 -Order over 300USD free shipping by Fast Express , such asDHL/UPS/FEDEX and so on. Please give us 5-star positive feedback if you are satisfied. If you are not satisfied, please contact us rather than leave a negative feedback. We will try our best to solve the problem.